Twin Speak:DressCode: President Obama: What About Abboud? President Obama: What About Abboud? 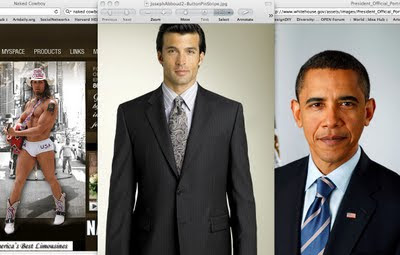 New York's Naked Cowboy, Two-Button Joseph Abboud suit, President Barack Obama, from left to right, above. WARNING: The above video is shot in cinema verite and cinema very cheap. Do not hate on us because we have no production staff! Thank you for your support.